When you arrive in Kos you will find fabulous costs and landscapes; but even in the town area, situated in the north. Eastern part of the island, there are some beautiful beaches that can be easily reached by foot or by the town. Bus that connects to various resort’s. There are many archaeological sites in and around the town of Kos it is the ideal place for walking or bicycling with a large variety of tourist shops, bars, coffee shops, tavern’s and restaurants. The Byron Apartments are situated on their own private beach and all have large balconies facing the Aegean Sea!All the apartments and studios are air-conditioned and simply furnished. Each one has a kitchenette equipped with a fridge, electric kettle..
General Description: Sunshine in Tigaki has 38 rooms, spread over 1 floor. The hotel is located 300 m from the sandy beach. The closest cities to the hotel are Tigaki (300 m) and Kos (12 km). To make your stay more comfortable a reception. The staff in.. 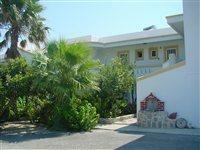 Located in Kos town, 400 m from Kos Port and 650 m from the beach. The family-run Karis Hotel is located in Kos Town, within 650 m from the pebbled beach of Kos and just a short walk from restaurants and shops. It is also situated 11 km from the sandy.. Located in Kos, just 800 m to the beach, 500 m to the center and 21 km to Kos International Airport. The Phaethon Hotel is situated just 1 km to the ruins of Asclepeion, a healing temple, 28 km to Kardamena and 40 km to Kefalos. Services and facilities..
Hotel located in Kos Town, within walking distance to the bars, taverns, shops and the old town, as well as approximately 600 m from the nearest beach. ** Note: Check-in only for adults over the age of 28 years old. ** Aegeon Hotel is located 100 m from..
Akti Dimis is situated directly across the road from Tigaki's sandy beach and 500 metres from the resort centre. Tigaki lies about 10 miles from the airport that has seen a lot of expansion in recent years. The long and sandy beach is one of the best..
Akti Dimis is situated directly across the road from Tigakis sandy beach and 500 metres from the resort centre. Tigaki lies about 10 miles from the airport that has seen a lot of expansion in recent years. The long and sandy beach is one of the best on..
Only steps from Kamari Bay's picturesque harbour and its small beach, this family-run complex offers self-catered accommodation with sea views, and features a swimming pool with sun-lounger terrace. All rooms have a fully equipped kitchenette with all..